Home Costs > How Much Does a Covered Deck Cost? How Much Does a Covered Deck Cost? Covering a deck is a great way to increase the value of your home and allow you to use it regardless of the weather conditions. How much does it cost to build a covered deck? The average costs for installing a covered deck will depend on many factors. This will include the size of the deck and the types of materials being used. When it comes to projects like this, the sky is the limit on how much you can spend. However, expect to spend at least $4,000. Keep in mind this is the price to cover the deck, not to build the entire deck. The estimates mentioned above will include, unless otherwise stated, the labor and materials. With so many factors that come into play, highly consider getting multiple quotes from HomeAdvisor.com. Here, you simply explain your job and reputable and licensed contractors in your area will contact you with quotes. Preview Construction Inc., a contractor we had found online, stated the price range when building a covered deck costs around $3,000 to $8,000. This estimation is good for a wood deck and includes the materials and the labor. HomeAdvisor.com says a roof can cost an additional $900 to $1,500 if you were having a new deck built. The costs can be higher since a new roof can require additional decking materials, additional framing and an additional permit may be required when adding the roof. 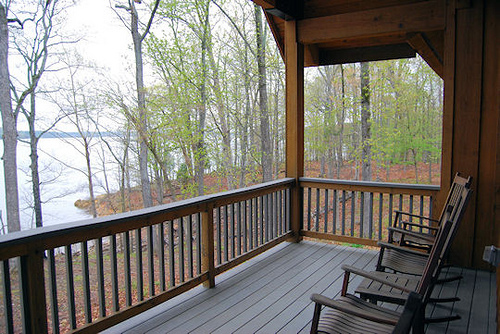 One of the greatest factors when pricing a covered deck will be the materials. Pressure treated wood, for example, can cost as little as $5 per square foot, whereas composite decking can be your costliest option, retailing for as much as $25+ per square foot. As with anything, the geographical range can play a role. A larger city will almost always be more than a smaller town, but this isn’t always the case if there wasn’t a lot of competition. Remember, these are the estimates to cover an existing deck, not to build a deck from scratch. Building a deck or even replacing a deck can cost an additional $3,000 to $20,000, depending on the size, materials being used, your local labor rates and accessories you may want to have added. Screening in the deck, if you were to want a fully enclosed deck, could add another $1,000 to $3,000 to the estimates mentioned above. Like any other home projects, installing a deck will require carpentry contractors, electricians, and depending on the scope, it may require other contractors as well. If you hire a contractor to do it, expect to pay for the labor costs. It usually starts at about $35+ per hour, depending on the location. Depending on the city you live in, you will more than likely need to pull building permits with the city. These costs will vary depending on your location as well as the length of the project. Most permits will be a few hundred dollars on average. If the deck already exists, a contractor, for the most part, will try to match the existing decking and home’s roofing material to be as close as possible. Depending on your preferences, the deck can then fully cover the deck, almost acting like a sun room, or it can similar to an awning, where it extends over the deck, protecting it from the elements. Do not compromise quality over affordability. Always hire a reputable contractor that offers a reasonable price to do the job. Always ask for references and be sure to look at work they have done in the past. Check with the BBB and look for review online. You may be able to save money on installation costs by being flexible with project scheduling. Try to schedule your project during the slower periods to save money. As with any construction project, try your best to get as many quotes as possible from local contractors. Most contractors will be more than happy to offer free estimates on your project. If you don’t know where to turn, consider getting multiple bids for free from HomeAdvisor.com.